The machinations of the PC component industry are interesting. Most companies that started off producing primarily DRAM have felt the need to branch out and diversify the business against the inherent fluctuations in the memory market. Corsair is the best example of this approach. Very few move into the RAM space from specialties in other products, yet graphics card stalwart Inno3D is doing exactly that with a line of premium iChiLL memory. 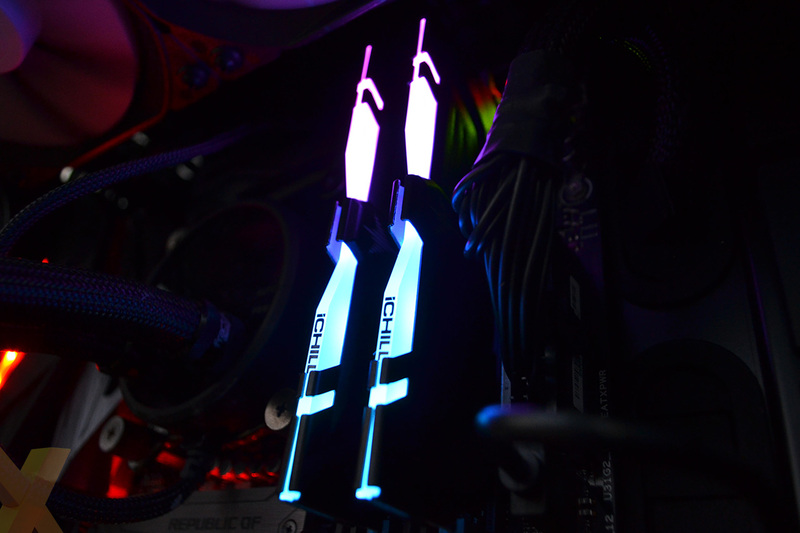 Inno3D opts for a single pack of bog-standard memory, a few lower-speed configurations of LED RAM, and then a swathe of kits using RGB lighting. Sensibly, the RGB kits, presented without any specific Inno3D branding, are all available in 16GB capacities (2x8GB), run from DDR4-3000 to DDR4-4000 speeds, and use various ICs to reach their rated specs. Our review sample, known as RCX2-16G3600A, comprises a dual-channel pack populated with DDR4-3600 speeds, 17-18-18-38 latencies, and an enthusiast 1.35V. Nothing untoward there. First impressions are mixed. Inno3D maintains a gamer feel with the iChiLL branding, central logo, and pressed aluminium heatspreader whose design is repeated on the other side. The downside to this approach is size, with the modules standing 50mm tall - or about as big as we have seen - potentially leading to problems in motherboards whose DIMM slots are uncomfortably close to the overhang of premium coolers. Going by our experience, having modules taller than 45mm brings clearance issues into play. The obvious reason for the extra-tall height is to make sufficient room for the RGB diffuser bar which flares upwards from the centre. The problem here is that the two the middle aluminium clasps don't hold the module in place - they are purely decorative - yet having them present only serves to obscure the lighting. It would have been preferable for Inno3D to not bother with the clasp at all, leaving more space for the RGB LEDs to light up the system. Even the edges limit the amount of light coming through. 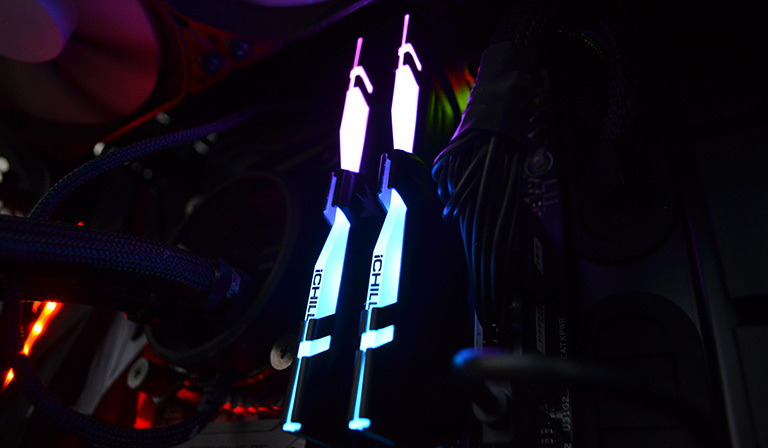 If a company is going to do RGB lighting then there needs to be largely unfettered visual access, such as present on Aorus or Corsair modules. The good news is that Inno3D uses bright, even lighting that does a spot-on job of illumination, regardless of the excess metal near the diffuser. By default, the modules display the usual rainbow effect. Fine-grained control is only available via the Asus Aura Sync program thereby limiting the appeal. We're not bothered that the company doesn't have a specific utility of its own to control the lighting - only the very biggest players bother with that - but we'd like to see the configurability extended to the RGB control systems used by Gigabyte, MSI and ASRock. Perhaps there could have been some clever tie-in with its range of graphics cards, as well? Some extra good news, for these modules at least, is that Inno3D uses Samsung B-Die chips (K4A8G085WB-BCPB), also present on the reviewed Aorus memory. Though nominally specced at 3,600MHz speeds via XMP, we found the sticks also ran at DDR4-3200 14-14-14-34-1T without any problems, and the frequency range and flexibility of the excellent ICs plays well with the enthusiast. Because Inno3D is just coming to the memory market, another downside is the lack of UK availability for this set. Our best guess is that it will retail for around £200, matching the incumbent, widely-available competition. Offering a mixture of positives and negatives, let's fire up the benchmark wagon and pass judgement.